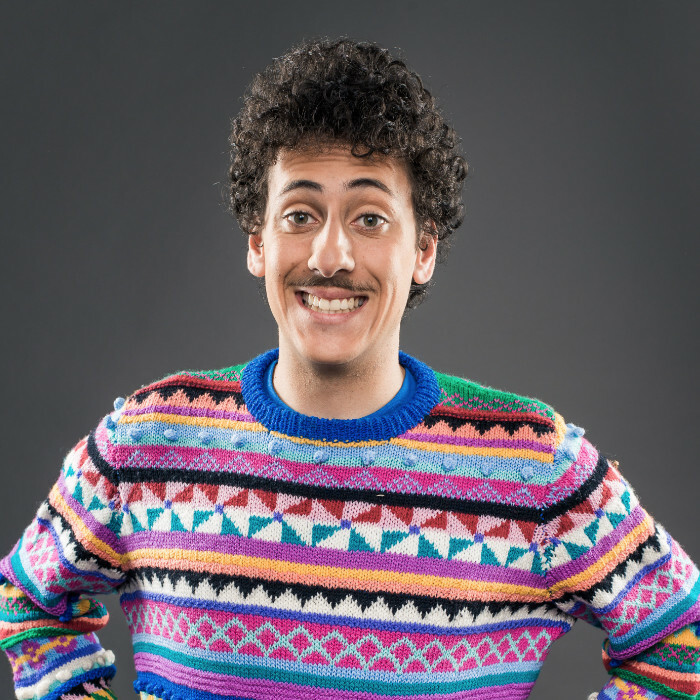 Schalk Bezuidenhout was born in a very Afrikaans, ‘bring-terug-Apartheid’ town right next to the airport in Joburg. In Kempton Park the traditional Afrikaans way of living was a good life. Your mother’s breast milk would be brannewyn en coke, you would walk kaalvoet to school, and you’d hide your lunch money when a black man walked past. His family and friends stood back as they watched Schalk evolve from an Afrikaans conservative caterpillar into a beautiful dramaqueen butterfly, complete with a moustache and furry afro. It was obvious to Schalk’s parents that he would study drama, and to help numb the pain they sent him away to study at the University of Cape Town. While studying in Cape Town Schalk slowly began to realise that there was so much more to life than boerewors and rugby, and started doing stand-up in April 2011. Schalk has come a far way in the short amount of time that he has been doing comedy. He has had the privelage to perform at some great venues, alongside some even greater comedians. Made it to the finals of the Graca Comedy Showdown in Johannesburg 2011. Stand-up performance every year at National Arts Festival since 2011. Performed on the Live @ 5 on 5fm. Performed at all the main comedy venues in Johannesburg, Cape Town and Durban. Performed in “Gemengde Vrugte: Afrikaans stand-up komedie” at The Stage in Belville, Ou Meul Teater in Paarl, Die Skuur Teater in Hermanus. Headline Act at Cape Town Comedy Club and Parkers Comedy & Jive. Winner of the Cape Town Graca Comedy Showdown 2012. Performed at the CT Nandos Comedy Festival @ The Artscape Opera House, 2012. Performed at Blacks Only 2013, 2014 and 2015. Performed at Keeping You in Stitches 2 and 3 (with Riaad Moosa). Various corporate and charity events. Member of Four Young Whites (which has performed at various venues around CT and JHB). Nominee and winner of the Savanna Newcomer Award at the Comics Choice Awards 2013. Nominee of Breakthrough Act at the Comics Choice Awards 2014. Jive Cape Town Funny Festival (full run), 2014. Trevor Noah’s NationWILD Tour 2014 and 2015. Trevor Noah’s opening act 2015. Nominee and winner of the Intermediate Award at the Comics Choice Awards 2015. Kanna Award for Best Up and Coming Artist 2015. Recorded his own Comedy Central special in June 2015.